Mom used to make quilts for all her friends grandbabies. In the last little while she has not been doing much quilting.. Last week I got a call from mom I need a favour, my friend is having a grandchild in due in October can you make me a baby quilt cause I know your fast. Sure mom I’d do anything for her as she has done so much for me my whole life. 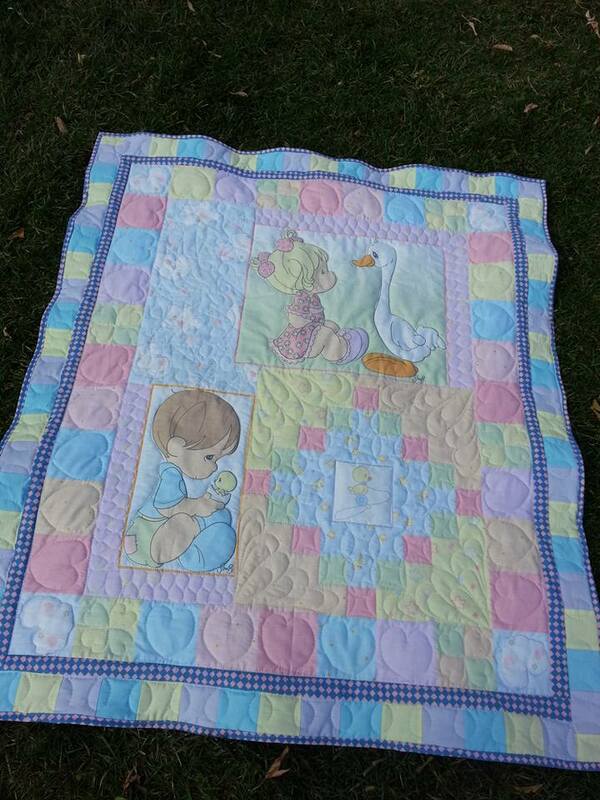 So on Friday mom gave me a panel to make a baby quilt. So once I got home I hit my stash to see if I could find anything that coordinated with the panel. Lucky I was able to find something. Pastels are not a common color in the fabrics that I have acquired. I used the checkered pink and blue fabric to make a 1″ frame around the complete panel. I did cut this on the bias so that I could have the fabric on the diagonal. Then I took all the pastel solids and cut them into 3″ strips width of fabric two of each color. I sewed these strips in order of blue and purple and sewed this into a strip set of 6. Once this was all pressed I sub cut the strips into 3″ I started using just the 6×24″ ruler but I find it much easier to use my stripology ruler. Once these were all cut they were sewn into strips of 3″ blocks. Sewed these to the border of the panel. Now was time to sandwich and quilt. I do all my quilting on my Pfaff Expression domestic machine. This panel was real fun to quilt as it had many different areas where I could play with diferent techniques of quilting. When I take pictues to show off the quilting I leave only one light on situated to the right of the desighn wall. This makes the quilting show up much more due to the shadows. Now to add the binding. I used the same checkered material to bind the quilt as I used for the inner border. I used the checkered material for backing. I started this quilt at 10 am and was finished by 2pm. Now all I have to do is call mom and let her know that the baby quilt is finished. Next Be Brave…Cut up those panels. thanks myrna. its nice to get feed back from a fellow Canadian. I’m glad I was able to give your an idea on making your panel more personalized.